My training plan always has this steady (which is race pace-ish HR) twelve mile run exactly one week from the event. Its meant to prepare you for some goal pace running with some fatigue still in place. Sort of simulating miles 6 – 18 in the race I figure. I was dreading this run a bit given the lackluster performances of the last few days. I usually would have done this run in the AM but I only got 6 hours of sleep after the concert and getting the kids up for school. Sleep is not going well. Haven’t slept more than 6 – 7 hours a night since Hawaii and its taking its toll. Anyway, I didn’t want to delay this run since it would cut into recovery time. So I got out at 4PM. I went as minimal as I could. Watch, HR monitor, shorts, socks and shoes. Suspiciously missing were the normal iPod and hat. On my feet, I broke out my race day LunaRacers that only get to see the light of day on race day. I figured I better given them a trial run not to take any chances. 77F as the high temp today. That’s going to be more than race temps for sure. I did not pick an easy route. 70% dirt roads. About 300 feet of elevation gain. I set the pace right at the high side of the range right off the bat. That hurts with no warm-up. About 158-160. Its all uphill for the first mile so I was really huffing. Started feeling better once I descended down to the shore of Union Reservoir. The wind was kicking up but wasn’t in my face. Kind of sideways for now. Ran hard up the hills and ran hard downhill too. Felt like I couldn’t make it through 12 at this pace after 3 miles in but then as my mind started to wander I was able to get in the groove and hold this HR just fine. It was just sub-LT so I was happy to sit right there. As I got to the midpoint and turned back east, the headwind became a factor. I kept up the same effort (same HR) but I could feel my self slowing as I fought the wind. I kept at it and the miles just melted away. Finally at about 9 miles in, I felt completely in rhythm. Not sure if it was the best pace of the run but I was feeling like I was standing tall and my legs were just motoring along. That’s what I was missing over the last few days. As I got back home and had 1 to go, I was pushing it up to LT. Felt like I could have held it longer. There was no leg fatigue at all. They were pushing hard. I felt like I needed an aid station for some water and a gel and I could have done it again. Through the entire run, I never looked at pace — only HR. I kept it in the high 150s the entire time. So when it was over, I covered my eyes and changed screens to see what the damage was: 7:05 average. How plain! What does that tell me? 6:51 is the magic number for Boston. 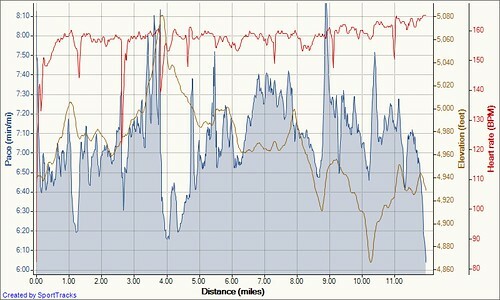 I had a hell of a headwind coming back and this isn’t the same course profile. I did have my racers on so that isn’t going to boost me. I do get a sea level bump (I hope) as well as a general race environment boost. Plus, I have a week of taper to go. I was hoping for a sub-7 average but didn’t hit it. Close though. I know you love graphs — but this is more for me to convince myself. Looks like the pace spikes followed the hills pretty smoothly. HR was pretty consistent but I floated it up at the end — sort of on purpose — I knew I had 2 to go, then 1 to go, so I just tried to push it a bit. Overall, I think this was a good result. I probably could have done it sub-7 on a flatter course with less wind. The big question is — will it scale? Can I do 26.2 slightly faster than this on the east coast in 7 days in the baddest marathon in the land? Sorry for all the analysis of a seemingly random training run. This what I have to do to build my confidence. I went 12.00 miles with an elevation gain of 282 feet in 01:25:10, which is an average pace of 07:05. Heart rate average was 155. View my GPS data on Garmin Connect.